Are IR Threats Just as Important as RF Threats? Like all of today’s technology, the advances in infrared (IR) tools and devices continue to develop at a rapid pace. IR cameras for thermal imaging and night vision have high definition (HD) quality and are priced at consumer-friendly levels. Governments and private organizations have utilized IR technology for a variety of reasons for espionage, surveillance, and monitoring for many years. IR cameras: Infrared cameras are also called thermal imaging cameras. They show the world around you in terms of heat signature, or the amount of heat given off by an object, person, or animal. They are used in construction and building maintenance to detect problems within walls, in hunting, and of course, for virtually undetectable video surveillance. For nighttime covert surveillance that doesn’t require any light, thermal imaging from an IR camera is hard to beat. While they once cost thousands of dollars and thus were mainly limited to military and government use, the options available today for just a few hundred dollars are astonishing. Laser microphones: As in IR cameras, the laser microphone has evolved dramatically in recent years. Laser microphones work by picking up the tiny vibrations in windows, walls, even in objects within a room and converting those vibrations back into sound using technology that is similar to a solar panel. Simple versions may be made by DIY specialists for under $20, but for well-funded criminals or corporate spies, advanced versions may be purchased that claim to be able to pick up sound through walls from a distance of several kilometers. Luckily, there are solutions for the IR threat. 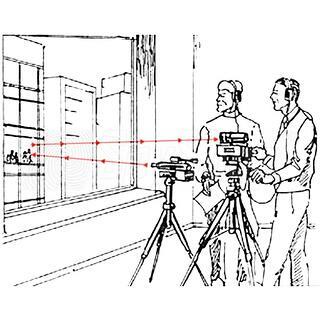 Signals Defense in Owing Mills, MD can provide you with window films that while perfectly clear, will block IR and laser devices from conducting surveillance on your business. If you’re considering upgrading security for your home or workplace, don’t focus solely on RF threats or physical security. Your workplace may be vulnerable to threats in the light spectrum that are virtually undetectable.